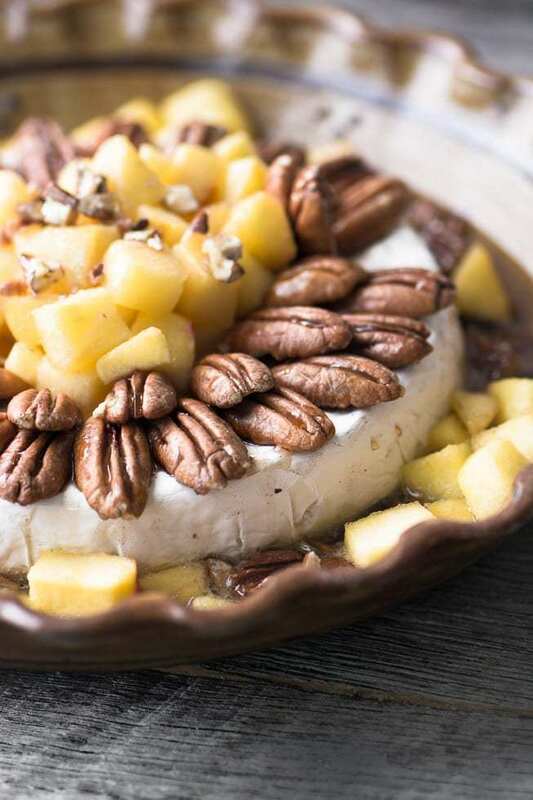 This quick and easy Baked Brie with Maple, Apples, and Pecans is the ultimate ooey gooey cheese appetizer ~ perfect for the holidays! Spread out the pecans in a single layer on a baking sheet and bake for about 12 minutes, stirring once or twice, until fragrant. Set aside. Melt the butter in a small saucepan and add the brown sugar, stir until dissolved. Add the apples and cook, stirring often, for 5 minutes. Set aside. Put the wheel of Brie in the center of your baking dish. Chop a few of the pecans for garnish, and arrange the others around the outer edge of the cheese, in 2 layers. Spoon the apples into the center, and arrange a few around the perimeter of the cheese. Top the apples with the chopped pecans. Heat the maple syrup in a small sauce pan until boiling and boil for 5 minutes. Drizzle the maple syrup over the apples, it will spill down the cheese and onto the sides. Cover loosely with foil and bake for about 30 minutes, or until everything is hot and the cheese is molten.